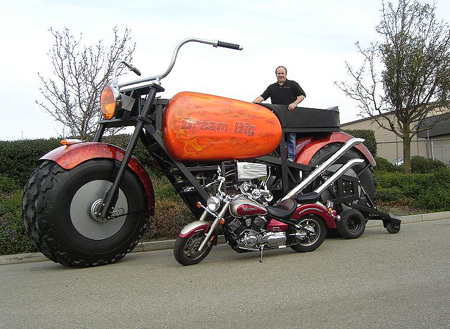 Standing a massive 15-feet tall, Greg Dunham’s “monster cycle” is claimed to be the world’s tallest rideable motorcycle by Guinness World Records. It weighs in at 6,500-pounds and took Greg over three years to build — spending $300,000 on parts. Riders sit in a specially designed cage underneath the handlebars to drive this monster. Video after the break. Click here for first picture in gallery.